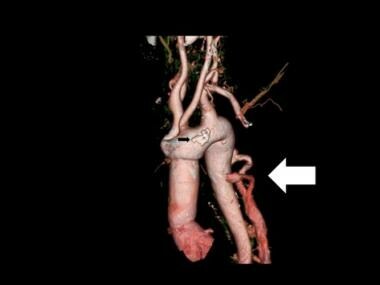 See the images of aortic dissection below. Contrast-enhanced axial CT image demonstrates an intimal flap that separates the 2 channels in the ascending and descending aorta diagnostic of a Stanford type A dissection. Courtesy of Joel L. Fishman, MD. Contrast-enhanced CT scan obtained at the level of the aortic arch demonstrates an aortic dissection with almost complete separation of the aortic intima. The slight prolapse may be the beginning of a configuration at risk for intimo-intimo intussusception, a potentially fatal event. Courtesy of Joel L. Fishman, MD. 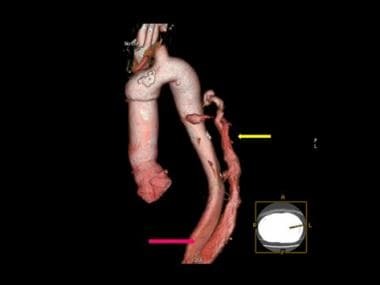 3-D color reconstruction of CTA in descending thoracic aortic dissection shows severance of the left renal artery due to dissection (white arrow). Note the few spidery collaterals at the point of left renal artery severance and the atheromatous calcified plaques (yellow arrow). 3-D color reconstruction of CTA in descending thoracic aortic dissection shows severance of the left renal artery due to dissection (yellow arrow). 3-D color reconstruction of CTA in descending thoracic aortic dissection shows resumption/re-entry of normal distal aortic circulation, past the point of the false lumen (yellow arrow). 3-D color reconstruction of CTA in descending thoracic aortic dissection shows the opening up of collateral circulation proximal to the point of dissection (yellow arrow). The dissection and the false lumen are demonstrated by the red arrow. 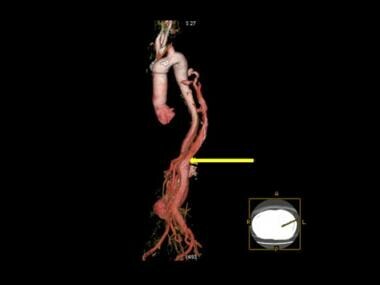 3-D color reconstruction of CTA in descending thoracic aortic dissection shows the opening up of collateral circulation proximal to the point of dissection (white arrow). The point of dissection is not shown. Note the aortic calcified plaque (black arrow). 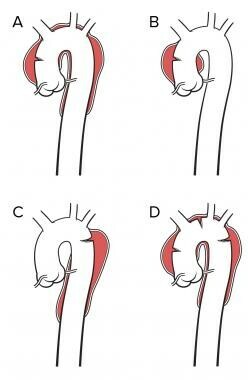 Most classic aortic dissections begin at 3 distinct anatomic locations: the aortic root; 2 cm above the aortic root; and just distal to the left subclavian artery. Ascending aortic involvement may result in death from wall rupture, hemopericardium and tamponade, occlusion of the coronary ostia with myocardial infarction, or severe aortic insufficiency. 3-D color reconstruction of CTA in descending thoracic aortic dissection shows the opening up of collateral circulation proximal to the point of dissection (yellow arrow). The point of dissection is not shown. Several factors determine the best modality for the initial evaluation and postoperative follow-up. These factors include the following: stability of the patient's condition, the patient's renal function, suspected postoperative complication, and the availability of each imaging modality. Maffei et al performed a randomized, controlled trial in which 44 patients (252 evaluations) were examined with TEE and CT. The authors concluded that both TEE and CT are atraumatic, safe, and accurate techniques for serial follow-up studies of patients treated for aortic dissection. Three noninvasive studies are associated with high specificity and sensitivity for aortic dissection. CT and MRI are associated with a sensitivity and a specificity of 94-100% and 95-100%, respectively. TEE is less sensitive and specific than spiral CT or MR, and TEE is operator-dependent. In addition, because of tracheal interposition, there is a 2 cm "blind spot" for TEE just proximal to the innominate arteries. Also, TEE is contraindicated in approximately 1% of patients (eg, TEE is contraindicated in patients with esophageal varices). Mediastinal widening is the most common plain radiographic finding in aortic dissection; it is noted in 80% of patients (see image below). Plain anteroposterior view of the chest demonstrates a wide mediastinum. Courtesy of Jorge J. Guerra, Jr, MD. All findings on plain images are nonspecific but may help in determining the need for further workup. Mediastinal fat commonly causes a widening of the mediastinum, which may lead to a false-positive diagnosis of aortic dissection. The sensitivity of CT for aortic dissection is 87-94%, and the specificity is 92-100%. A typical helical scanning protocol for aortic dissection includes the following parameters: 5-mm collimation, 1.5 pitch, and 7.5-mm imaging spacing. Multidetector CT may be performed with 1-2.5 mm collimation. 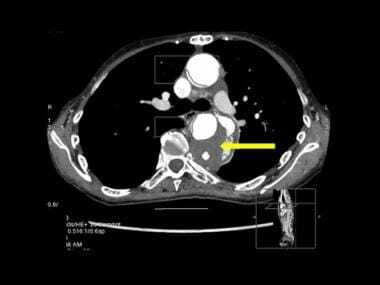 Initial nonenhanced CT is used for the diagnosis of acute hemorrhage and aortic rupture. This is followed by helical CT performed approximately 25-30 seconds after the injection of contrast material. Nonionic contrast material (120-135 mL) is power injected via a peripheral intravenous site at a rate of 3-4 mL/s. Because cardiac output is quite variable in these sick patients, a test injection of contrast should be used to determine circulation time; alternatively, an automated bolus detection scheme may be used. One advantage of the test injection method is that one may visually differentiate the true and false lumen on the basis of contrast arrival time. Usually, scanning is performed from the thoracic inlet to the common femoral arteries. When a dissection is identified, repeat scanning may be performed to obtain delayed images of the false lumen and aortic branches. Multiplanar reformation images are obtained in sagittal, coronal, oblique sagittal, and curved projections generated with an independent workstation. The use of volume rendering may be helpful for planning surgery. Nonenhanced CT scan of the chest demonstrates a type B acute aortic intramural hematoma with displacement of intimal calcification and a crescentic high-attenuating clot without mass effect on the aortic lumen. Courtesy of Joel L. Fishman, MD. Contrast-enhanced axial CT image demonstrates an intimal flap that separates the 2 channels in the ascending aorta and descending aorta and begins at the level of the aortic root. Courtesy of Joel L. Fishman, MD. 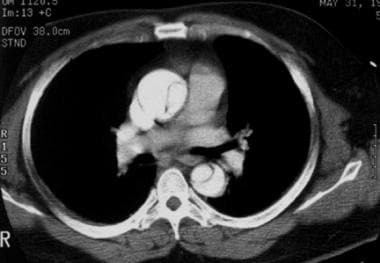 Hemorrhagic pleural and pericardial effusions and mediastinal hemorrhage may be seen. Inadequate contrast opacification may lead to false-negative findings of aortic dissection. 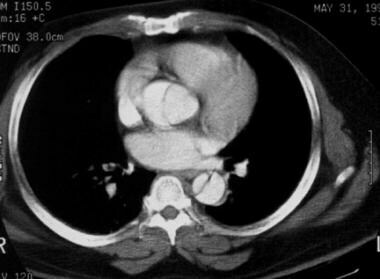 Aortic intramural hematoma may be misinterpreted as an aneurysm with thrombus or arteritis. Spiral CT artifacts include perivenous streaks and motion artifacts. The perivenous streaks are caused by beam hardening and motion resulting from transmitted pulsation in a vein that carries undiluted contrast medium into the heart. Some authors recommend injecting the contrast agent at a rate of 2 mL/s via a peripheral intravenous site in the right arm. Aortic motion artifact is produced by the aortic wall motion from the end of diastole to the end of systole. Typically, this artifact is seen in the left anterior and right posterior margins of the aortic circumference. In some patients, especially those with cystic medial necrosis, the intimal flap may be subtle. CT scanning for patients with type B intramural hematoma is useful in determining morphologic evolution and intimal erosion. It also helps assess predictive factors that would allow for better endovascular prognosis and treatment. In a study by Schlatter et al , it was determined that complications or morphologic progression were tied to preexisting intimal anomalies seen on the initial CT.  Increasing the detection rate of intimal anomalies, such as intimal erosion and aortic branch artery lesions, was done by using multislice CT, with systematically delayed phase and millimetric thin slices. Axial CT scan through the upper abdomen in mid-descending thoracic aortic dissection shows the dissection flap entering the abdominal aorta (white arrow). Note the normally perfused right renal artery and poorly perfused upper pole of the left kidney at the point of dissection. Axial CT scan through the mid-descending aorta in aortic dissection shows the false lumen (yellow arrow). MRI is an accurate tool for use in diagnosis of aortic dissection, but it may not be readily available in the acute setting. In addition, unstable patients with Swan-Ganz catheters should not undergo MRI. [28, 29, 30, 31, 32, 33, 13, 24, 34, 26, 16] The sensitivity and specificity of MRI for aortic dissection are both more than 90%. An intimal flap of medium signal intensity is surrounded by a signal void of fast-flowing blood on "black blood" echocardiogram (ECG)-gated spin-echo or double inversion recovery single-shot fast spin-echo MRI (see the image below). 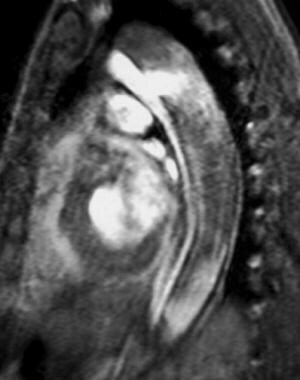 Sagittal gradient-echo MRI image obtained in early systole shows a jet of blood flowing through the intimal tear from the smaller anterior true lumen into the larger posterior false lumen. The intimal flap is recognized as the medium signal intensity linear structure that divides the true and false lumens. An aortic stent-graft could be placed across the intimal/entry tear in the descending thoracic aorta to redirect blood into the anterior true lumen. Courtesy of Joel L. Fishman, MD. With cine gradient echo imaging, the intimal flap appears as a dark line against the high signal intensity of the flowing blood; it may change configuration during the cardiac cycle. It is important that a careful examination of the aortic flap be conducted during the cardiac cycle with cine MRI so as to detect the presence of "true lumen collapse," which may be associated with end-organ ischemia. In some cases, the intima is stripped 360° from the media and is essentially "free floating"; this may result in catastrophic intimo-intimo intussusception. Newer pulse sequences such as true fisp or Fiesta offer very fast cine imaging. Basic MRI sequences for evaluating aortic dissection include spin-echo T1-weighted or breath-hold double inversion recovery sequences, cardiac-gated gradient-echo sequences, and three-dimensional (3D) thin-section MR angiography with a bolus injection of a single or double dose of gadolinium-based contrast agent. MRI findings of AIH include a crescent of blood surrounding but not compressing the aorta. The signal intensity of the crescent varies with age on T1-weighted imaging: it is isointense to muscle in the acute setting and is markedly hyperintense after 3-7 days. Potential drawbacks of MRI include reported artifacts on cardiac-triggered thoracic spin-echo phase images. These may appear as an artifactual borderlike feature across the aorta (caused by helical flow in the aorta) that may be interpreted as a dissection. Other potential causes of misinterpretation include an atypical configuration of the intimal flap seen in short dissections and multiple false channels in cases in which the flaps are complex. Aortic anomalies also may cause confusion. 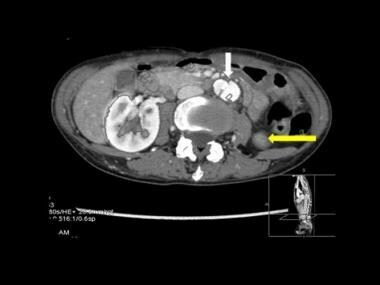 False-positive findings seen in gadolinium-enhanced MRA include a central line or "maki" artifact. 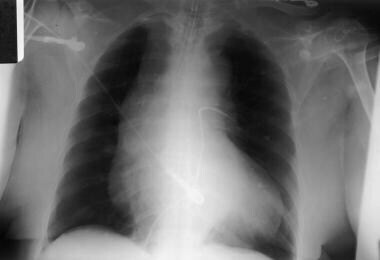 This occurs when the acquisition is performed too early as intra-aortic gadolinium concentration is rising. This artifact may be readily differentiated from an aortic dissection because it does not take a spiral course like a true intimal flap. Gadolinium-based contrast agents have been linked to the development of nephrogenic systemic fibrosis (NSF) or nephrogenic fibrosing dermopathy (NFD). For more information, see the Medscape Reference topic Nephrogenic Systemic Fibrosis. NSF/NFD disease has occurred in patients with moderate to end-stage renal disease after being given a gadolinium-based contrast agent to enhance MRI or MRA scans. NSF/NFD is a debilitating and sometimes fatal disease. Characteristics include red or dark patches on the skin; burning, itching, swelling, hardening, and tightening of the skin; yellow spots on the whites of the eyes; joint stiffness with trouble moving or straightening the arms, hands, legs, or feet; pain deep in the hip bones or ribs; and muscle weakness. According to a study by Mastrogiovanni, TEE was the favored study for the evaluation of aortic dissection. In their report of 54 patients, TEE findings confirmed the diagnostic dissection in all patients but one. TEE noted the site of the intimal tear; the extension of the dissection, pericardial effusion, aortic incompetence; and left ventricular function. Because of the high level of correspondence between the diagnosis made at TEE and the surgical anatomic findings, the authors favored the use of TEE—for many cases, as the sole diagnostic modality. A tortuous aorta may result in a false-positive diagnosis of dissection. 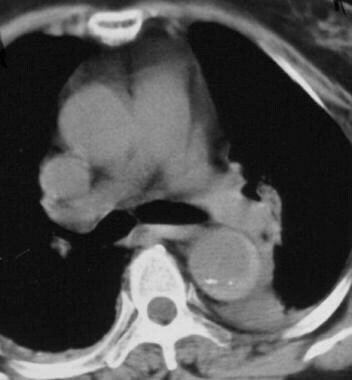 In cases involving a massive dilated ascending aorta (usually occurring as a result of cystic medial necrosis), it may be difficult to identify a small intimal flap. Intravascular ultrasonography (IVUS) plays an essential role in the diagnosis and classification of aortic dissection, evaluation of dissection flap, and whether or not it exhibits dynamic or static obstruction to the aortic branches. IVUS is an imaging guidance for fenestration for the treatment of aortic dissection and endograft placement. Aortography was the reference standard for the preoperative evaluation and diagnosis of aortic dissection. With the advent of transesophageal echocardiography (TEE), CT, and MRI, its role has become important only if nonsurgical interventional procedures are indicated. Aortographic findings are less sensitive than those of newer noninvasive techniques, especially for aortic intramural hematoma. It is quite controversial whether coronary angiography should be performed before sternotomy in a stable patient with aortic dissection, inasmuch as concomitant coronary bypass grafting may be performed if diseased vessels are present. 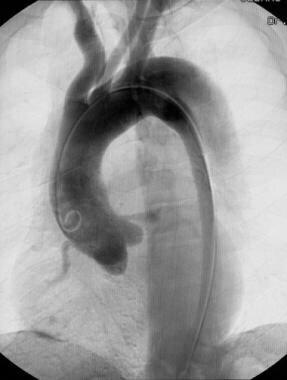 Oblique arteriogram of the thoracic aorta demonstrates the double-barrel aorta sign of aortic dissection. Both the true and false lumina are opacified. Courtesy of Joel L. Fishman, MD. During aortography, overinjection of the false lumen should be avoided if it is entered during the procedure. The operator should be suspicious if he or she has difficulty advancing the guidewire into the aortic valve. Abdominal and pelvic aortography should be included in the diagnostic study to assess the level of the reentry site. Obstruction of the aortic branches may be noted (most commonly in the left renal artery, which is the site in approximately 25-30% of patients). Visceral and extremity ischemia may occur when the superior or inferior mesenteric arteries and the iliac arteries are compromised. Pitfalls of angiography include a lack of visualization of the false lumen because of thrombosis or inadequate opacification with contrast material. Streak artifacts secondary to aortic or cardiac motion or opacification of the sinus of Valsalva may be confused with thrombus. Pitfalls also include missing the diagnosis of an intramural hematoma (frequently associated with progression to frank dissection) and misdiagnosis when the false lumen is thrombosed. Kamalakannan D, Rosman HS, Eagle KA. Acute aortic dissection. Crit Care Clin. 2007 Oct. 23(4):779-800, vi. [Medline]. Siegal EM. Acute aortic dissection. J Hosp Med. 2006 Mar. 1(2):94-105. [Medline]. Clough RE, Zymvragoudakis VE, Biasi L, Taylor PR. Usefulness of new imaging methods for assessment of type B aortic dissection. Ann Cardiothorac Surg. 2014 May. 3 (3):314-8. [Medline]. Erbel R, Zamorano J. The aorta. Aortic aneurysm, trauma, and dissection. Crit Care Clin. 1996 Jul. 12(3):733-66. [Medline]. Flachskampf FA, Daniel WG. Aortic dissection. Cardiol Clin. 2000 Nov. 18(4):807-17, ix. [Medline]. Hagan PG, Nienaber CA, Isselbacher EM. The International Registry of Acute Aortic Dissection (IRAD): new insights into an old disease. JAMA. 2000 Feb 16. 283(7):897-903. [Medline]. Golledge J, Eagle KA. Acute aortic dissection. Lancet. 2008 Jul 5. 372(9632):55-66. [Medline]. Schäfers HJ, Kunihara T. Towards safer reoperations: special aspects in aortic dissection. Eur J Cardiothorac Surg. 2008 Apr. 33(4):700-2. [Medline]. Kahn SL, Dake MD. Stent graft management of stable, uncomplicated type B aortic dissection. Perspect Vasc Surg Endovasc Ther. 2007 Jun. 19(2):162-9. [Medline]. Fisher ER, Stern EJ, Godwin JD II. Acute aortic dissection: typical and atypical imaging features. Radiographics. 1994 Nov. 14(6):1263-71; discussion 1271-4. [Medline]. Miller JS, Lemaire SA, Coselli JS. Evaluating aortic dissection: when is coronary angiography indicated?. Heart. 2000 Jun. 83(6):615-6. [Medline]. San Roman JA, Vilacosta I, Fernandez-Aviles F. [Aortic dissection: clinical evaluation, comparison of diagnostic techniques and treatment election]. Rev Esp Cardiol. 1996. 49 Suppl 4:2-12. [Medline]. Liu Q, Lu JP, Wang F, Wang L, Tian JM. Three-dimensional contrast-enhanced MR angiography of aortic dissection: a pictorial essay. Radiographics. 2007 Sep-Oct. 27(5):1311-21. [Medline]. Prabhakar AM, Le TQ, Abujudeh HH, Raja AS. 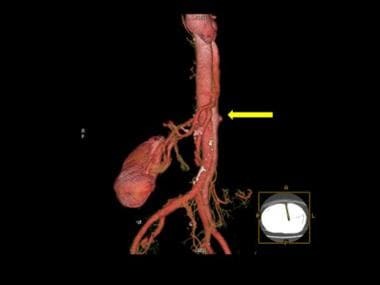 Incidental findings and recommendations are common on ED CT angiography to evaluate for aortic dissection. Am J Emerg Med. 2015 Nov. 33 (11):1639-41. [Medline]. Kinner S, Eggebrecht H, Maderwald S, Barkhausen J, Ladd SC, Quick HH, et al. Dynamic MR angiography in acute aortic dissection. J Magn Reson Imaging. 2015 Aug. 42 (2):505-14. [Medline]. Cheng Z, Juli C, Wood NB, Gibbs RG, Xu XY. Predicting flow in aortic dissection: comparison of computational model with PC-MRI velocity measurements. Med Eng Phys. 2014 Sep. 36 (9):1176-84. [Medline]. Maffei S, Baroni M, Terrazzi M. Ambulatory follow-up of aortic dissection: comparison between computed tomography and biplane transesophageal echocardiography. Int J Card Imaging. 1996 Jun. 12(2):105-11. [Medline]. Mast HL, Gordon DH, Kantor AM. Pitfalls in diagnosis of aortic dissection by angiography: algorithmic approach utilizing CT and MRI. Comput Med Imaging Graph. 1991 Nov-Dec. 15(6):431-40. [Medline]. Ganten MK, Weber TF, von Tengg-Kobligk H, Böckler D, Stiller W, Geisbüsch P, et al. Motion characterization of aortic wall and intimal flap by ECG-gated CT in patients with chronic B-dissection. Eur J Radiol. 2008 Aug 2. [Medline]. Hastaoglu IO, Sokullu O, Sanioglu S, Sahin S, Kut MS, Deniz H, et al. [The role of multislice tomography to prevent postoperative strokes related with atherosclerotic plaques in the ascending aorta after coronary artery bypass]. Anadolu Kardiyol Derg. 2008 Aug. 8(4):291-6. [Medline]. Weber TF, Ganten MK, Böckler D, Geisbüsch P, Kopp-Schneider A, Kauczor HU, et al. Assessment of thoracic aortic conformational changes by four-dimensional computed tomography angiography in patients with chronic aortic dissection type b. Eur Radiol. 2009 Jan. 19(1):245-53. [Medline]. Chiu KW, Lakshminarayan R, Ettles DF. 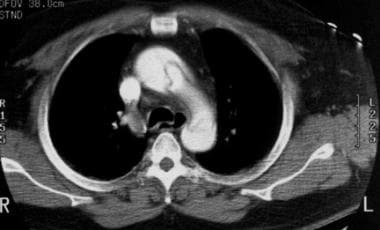 Acute aortic syndrome: CT findings. Clin Radiol. 2013 Apr 11. [Medline]. Listijono DR, Pepper JR. Current imaging techniques and potential biomarkers in the diagnosis of acute aortic dissection. JRSM Short Rep. 2012 Nov. 3(11):76. [Medline]. [Full Text]. Lovy AJ, Rosenblum JK, Levsky JM, Godelman A, Zalta B, Jain VR, et al. Acute Aortic Syndromes: A Second Look at Dual-Phase CT. AJR Am J Roentgenol. 2013 Apr. 200(4):805-11. [Medline]. Jánosi RA, Erbel R, Konorza TF. Recent advances in the diagnosis of acute aortic syndromes. Expert Opin Med Diagn. 2012 Nov. 6(6):529-40. [Medline]. Schlatter T, Auriol J, Marcheix B, Lebbadi M, Marachet MA, Dang-Tran KD, et al. Type B intramural hematoma of the aorta: evolution and prognostic value of intimal erosion. J Vasc Interv Radiol. 2011 Apr. 22(4):533-41. [Medline]. Bogaert J, Meyns B, Rademakers FE. 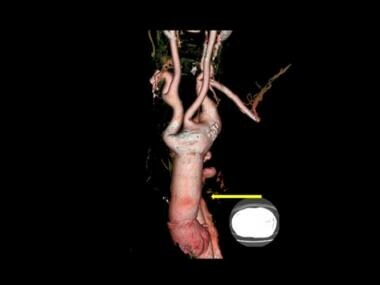 Follow-up of aortic dissection: contribution of MR angiography for evaluation of the abdominal aorta and its branches. Eur Radiol. 1997. 7(5):695-702. [Medline]. Ho VB, Prince MR. Thoracic MR aortography: imaging techniques and strategies. Radiographics. 1998 Mar-Apr. 18(2):287-309. [Medline]. Kaminaga T, Yamada N, Takamiya M. Sequential MR signal change of the thrombus in the false lumen of thrombosed aortic dissection. Magn Reson Imaging. 1995. 13(6):773-9. [Medline]. 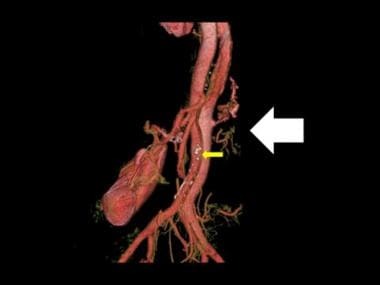 Krinsky GA, Rofsky NM, DeCorato DR. Thoracic aorta: comparison of gadolinium-enhanced three-dimensional MR angiography with conventional MR imaging. Radiology. 1997 Jan. 202(1):183-93. [Medline]. Nitatori T, Yokoyama K, Nakamura A. Clinical application of single shot GRE-EPI as non-enhanced MRA (EPI- MRA) for aortic aneurysm and dissection. Radiat Med. 1999 Sep-Oct. 17(5):393-7. [Medline]. Sakuma H, Bourne MW, O''Sullivan M. Evaluation of thoracic aortic dissection using breath-holding cine MRI. J Comput Assist Tomogr. 1996 Jan-Feb. 20(1):45-50. [Medline]. Clough RE, Waltham M, Giese D, Taylor PR, Schaeffter T. A new imaging method for assessment of aortic dissection using four-dimensional phase contrast magnetic resonance imaging. J Vasc Surg. 2012 Apr. 55(4):914-23. [Medline]. Armstrong WF, Bach DS, Carey LM. Clinical and echocardiographic findings in patients with suspected acute aortic dissection. Am Heart J. 1998 Dec. 136(6):1051-60. [Medline]. Penco M, Paparoni S, Dagianti A. Usefulness of transesophageal echocardiography in the assessment of aortic dissection. Am J Cardiol. 2000 Aug 17. 86(4 Suppl 1):53-56. Mastrogiovanni G, Masiello P, Leone R. Emergency surgical management of acute aortic dissection: role of transesophageal echocardiography. G Ital Cardiol. 1999 Oct. 29(10):1137-41. [Medline]. Unenhanced CT scan of the chest depicts a complex dissection with multiple false channels in an aneurysmal descending aorta. Aortic rupture could not be excluded, as there is a large aorta with hyperintense areas of fresh hematoma and a pleural effusion. Left lower lobe lung disease is present. Courtesy of Joel L. Fishman, MD.